First things first. 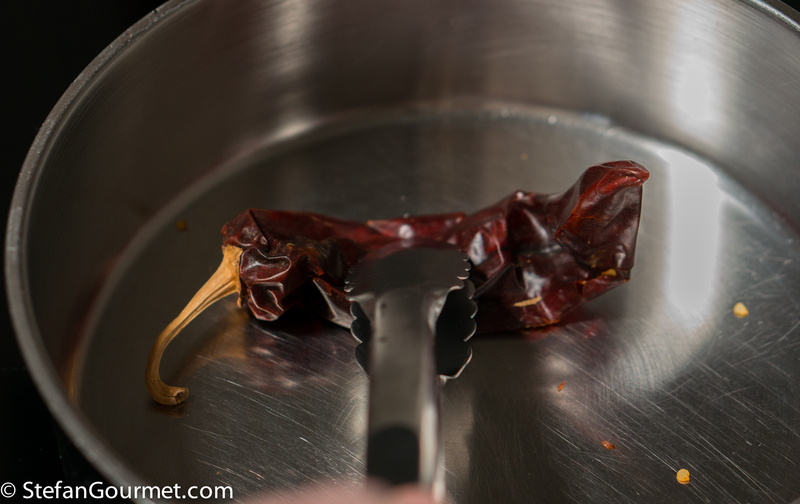 Toast the chiles in a hot frying pan, being careful not to burn them. 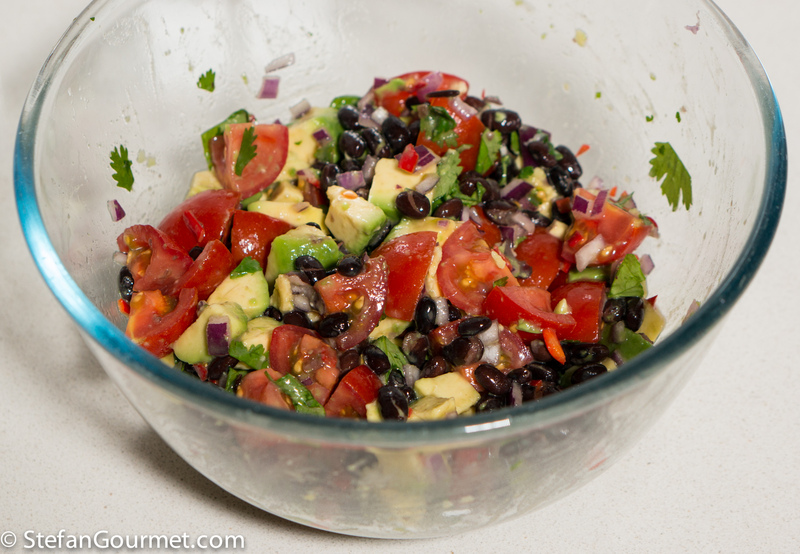 Put the chiles in a bowl and cover with hot water. 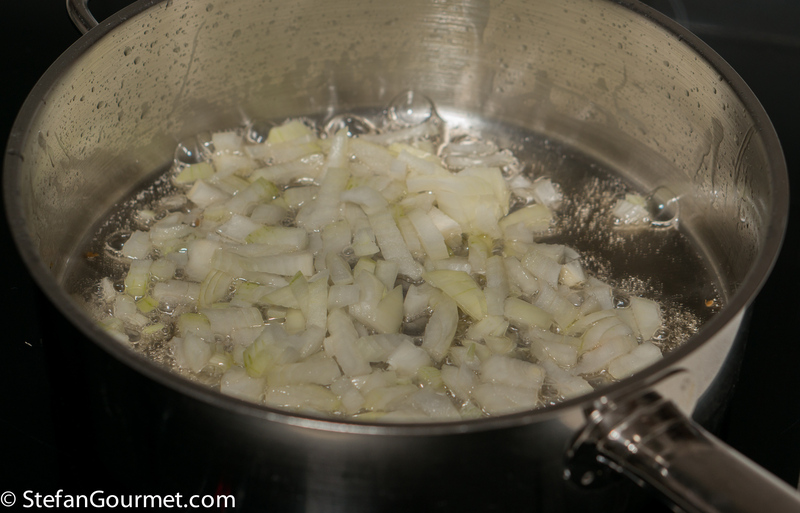 Put a plate on top to keep the chiles submerged, and allow them to soak for 10 minutes or so. 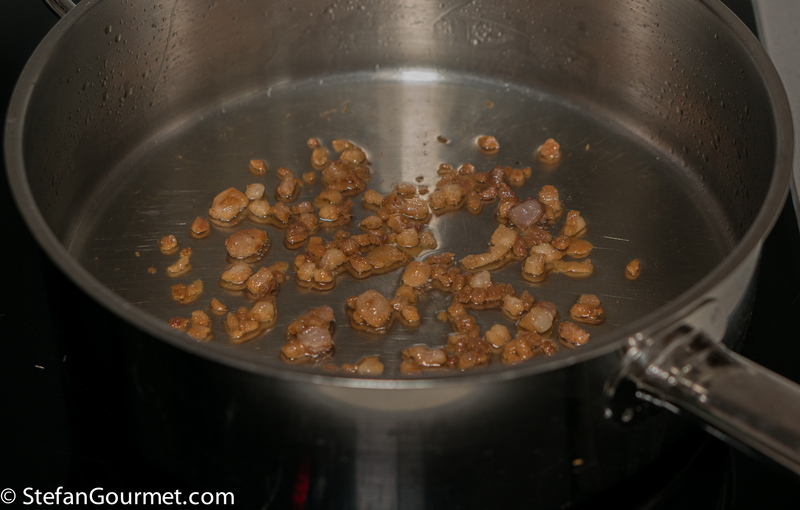 …and discard the cracklings (or eat them, if you like). 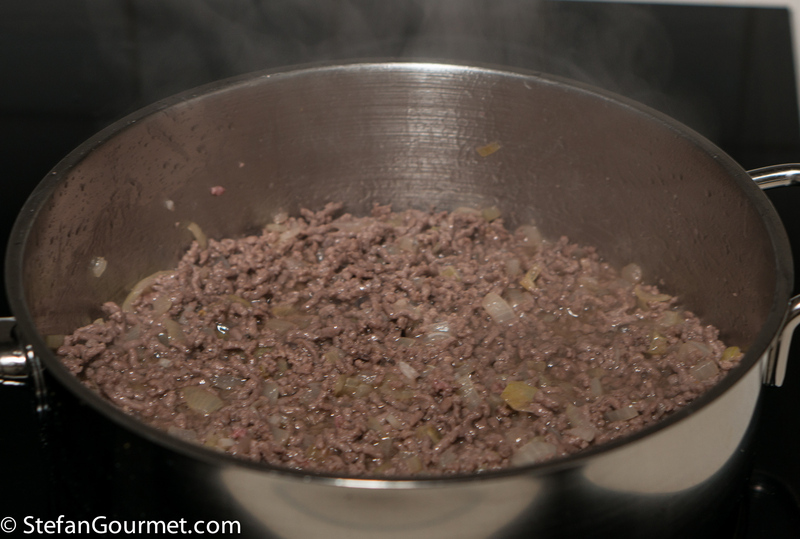 Add a chopped onion to the beef fat, and stir until translucent. 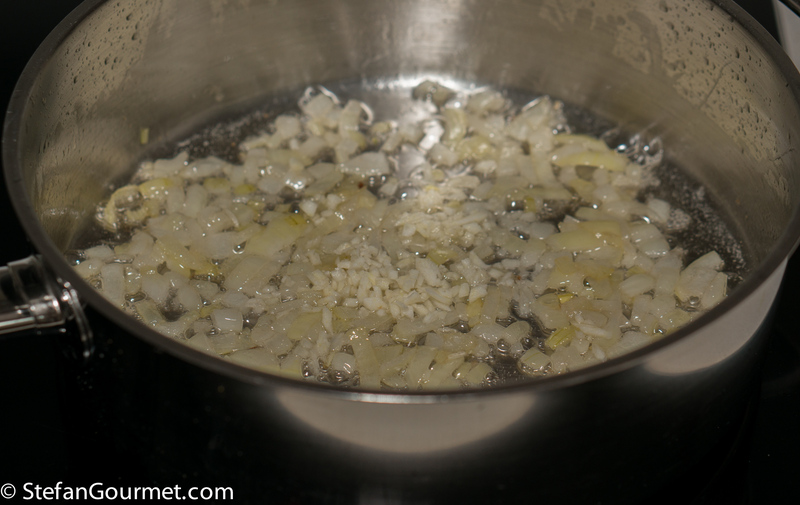 Add a minced clove of garlic, and stir for a minute. Make sure not to allow the garlic to brown. 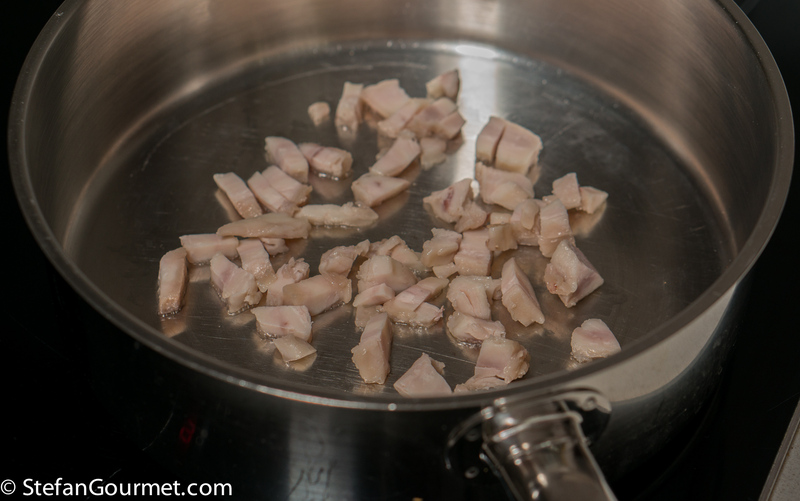 …until the raw meat color has disappeared. 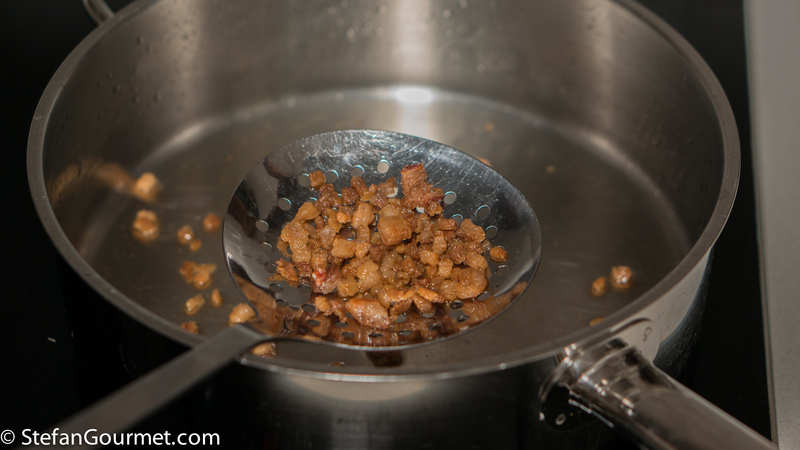 There is no need to brown the meat more, as that will give you a gritty texture. 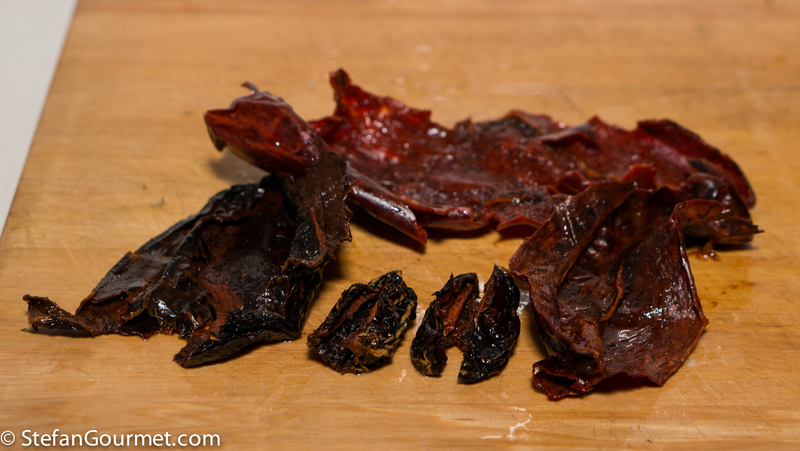 In the meantime the chiles should be done soaking. Remove the seeds and stems. 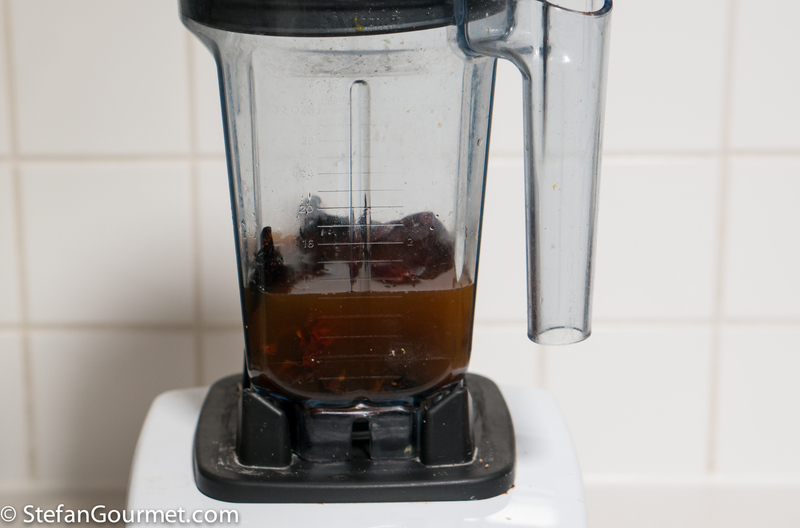 Put the chiles in a blender with 250 ml of beef stock. 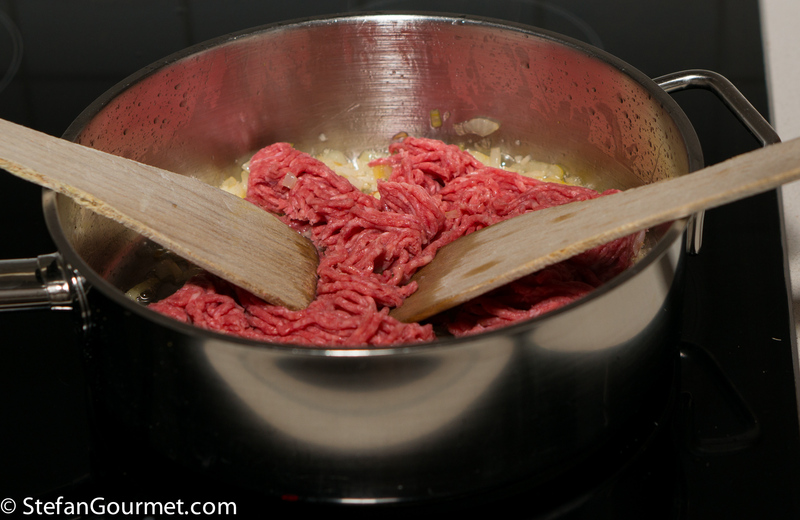 Add the chile mixture to the beef. 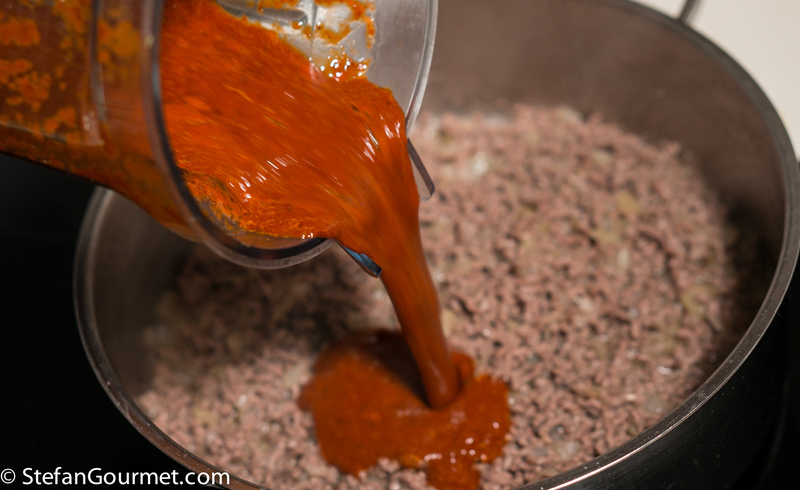 Season with 1/4 tsp ground coriander, 1/2 tsp smoked paprika, 1/2 tsp dried oregano, 1 tsp ground cumin, 1/8 tsp sugar (piloncillo if you have it), and 1 Tbsp tomato paste. Stir to incorporate the seasonings. 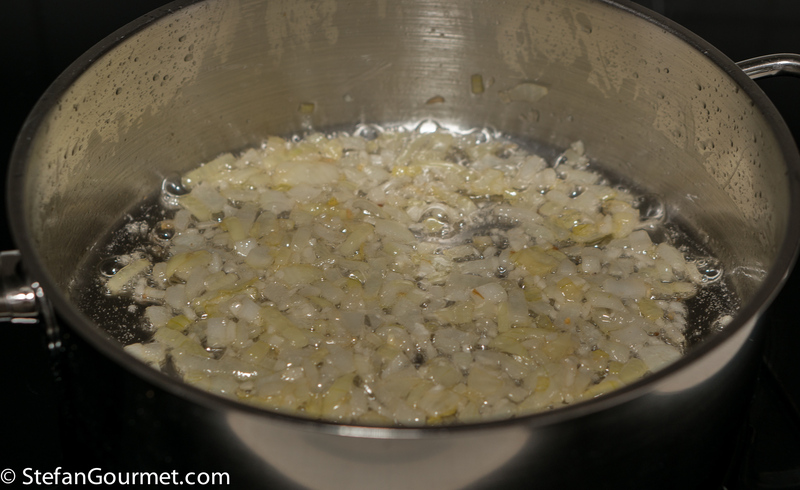 Bring to a boil, then reduce the heat to a simmer with only an occasional bubble. 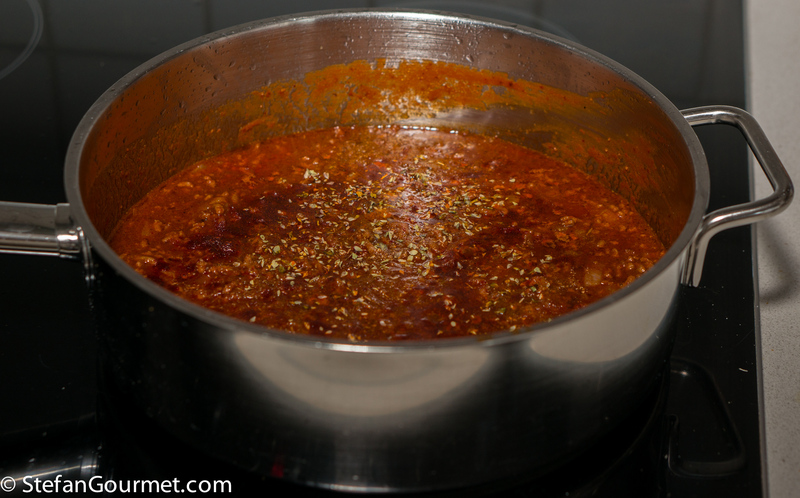 Allow the chili to simmer over very low heat until it is thick, about 45 minutes. 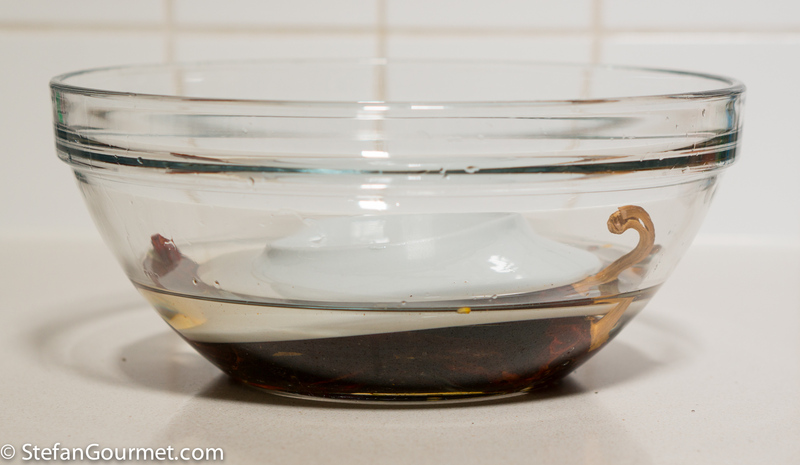 Make a slurry of 3 Tbsp masa with as much cold water as needed. Add this to the chili, and stir well. 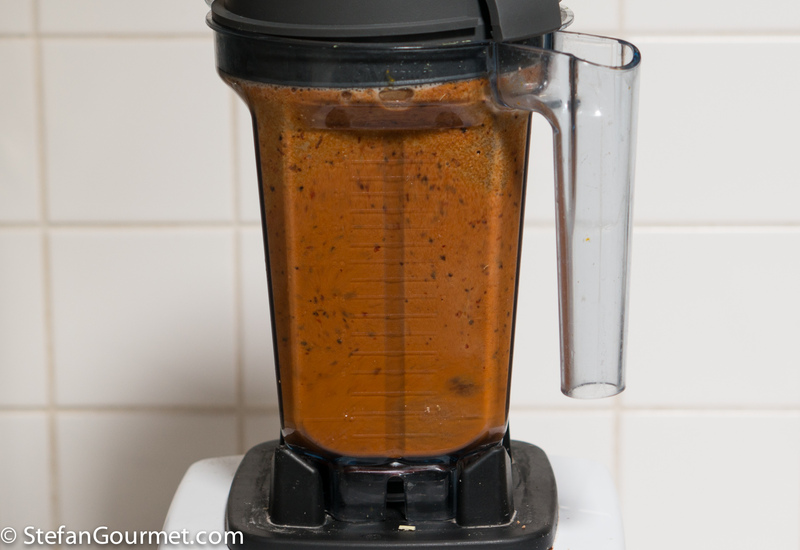 This will thicken the chili even further. Put the chili in a bowl. 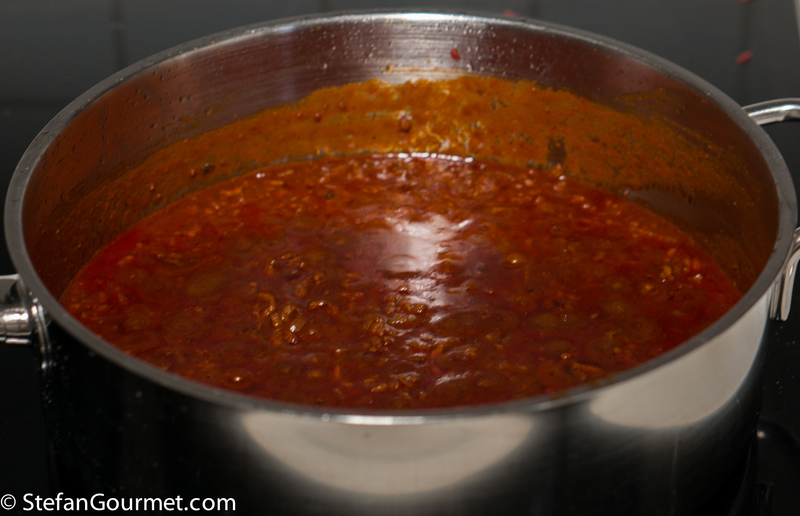 Allow to cool to room temperature, then cover and refrigerate to allow the chili to firm up. 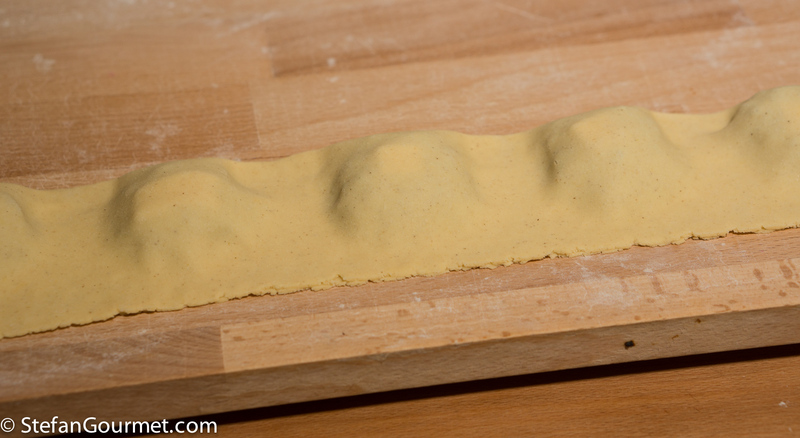 In the meantime, make pasta dough with 100 grams masa, 50 grams flour, and 2 eggs. The exact amount of flour will depend on the size of the eggs. 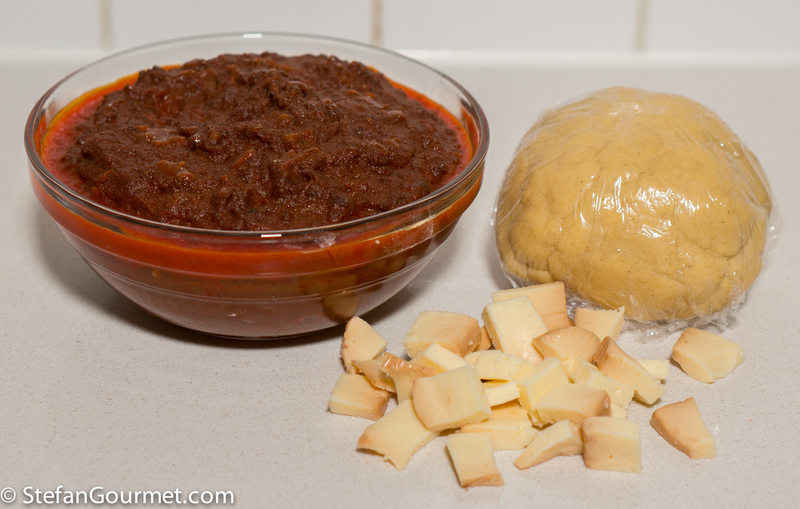 When the dough is finished, wrap it in cling film and allow to rest in the refrigerator for at least an hour. 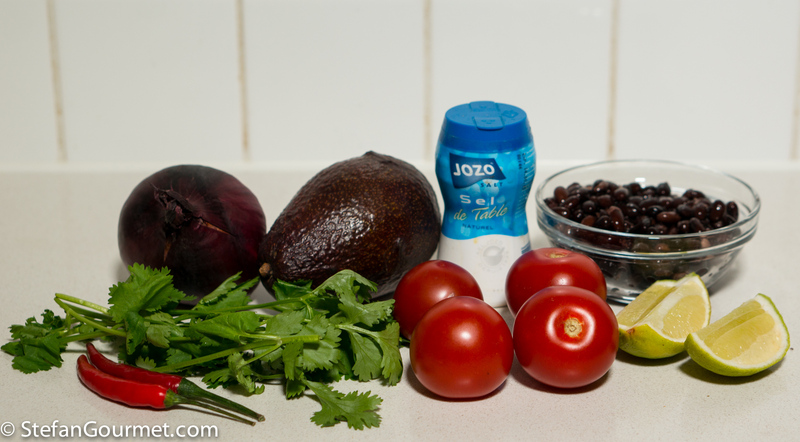 Prepare the salsa by combining 2 chopped tomatoes (or 4 small ones), 1 avocado (peeled and diced), 1/2 minced red onion, juice from 1/2 lime, 1 Tbsp minced fresh cilantro, 1 or 2 red chilli peppers, with or without seeds, minced, 120 grams (1/2 can) cooked black beans, drained, and salt to taste in a bowl. 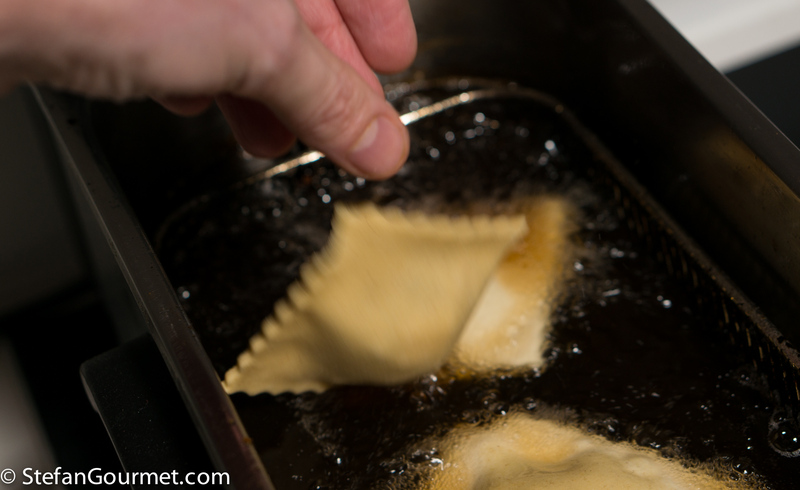 Stir to mix, and allow the flavors to develop while you make the ravioli. 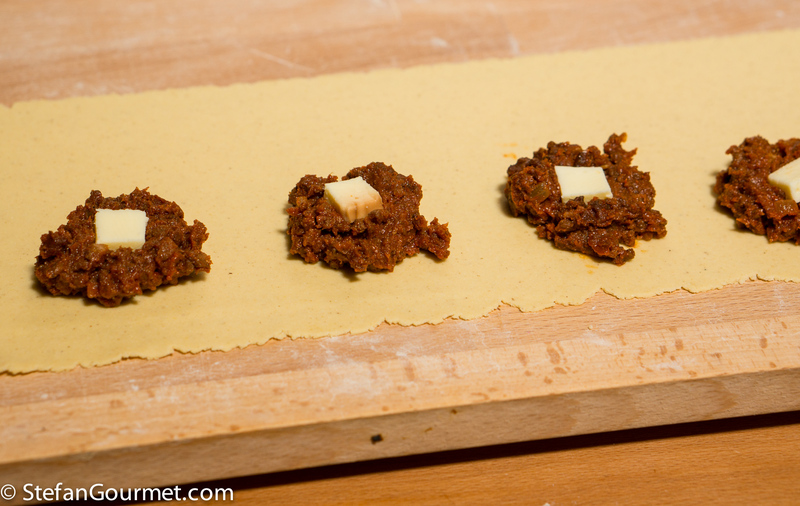 To make the ravioli you will need the chilled chili (from above), the masa-based pasta dough (from above), and about 100 grams of smoked mozzarella cut into small pieces. 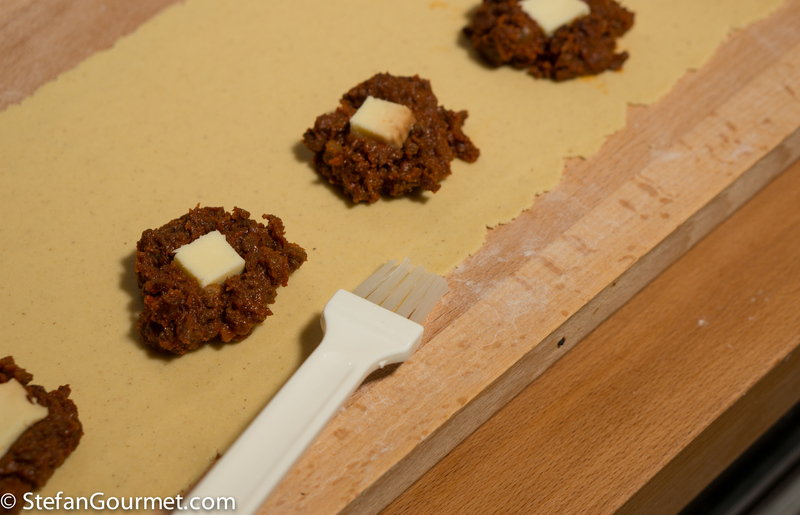 Roll out the dough, which is not as easy as usual pasta dough because there is less gluten, so you won’t be able to get it as thin. 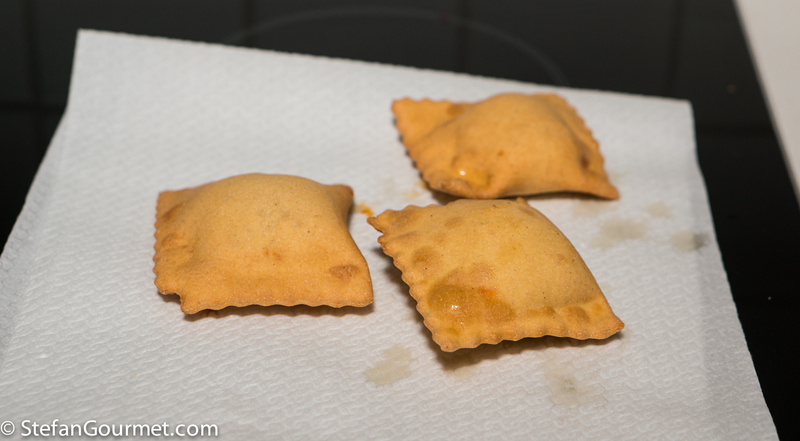 Make ravioli according to my instructions with about a tablespoon of chili and a piece of scamorza in each. 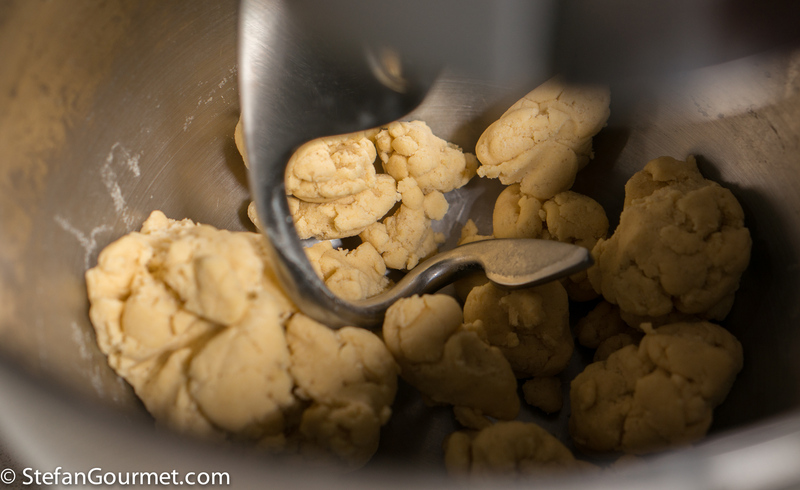 Unlike regular pasta dough, it is required to moisten the pasta dough with a bit of water in order to get a good seal. 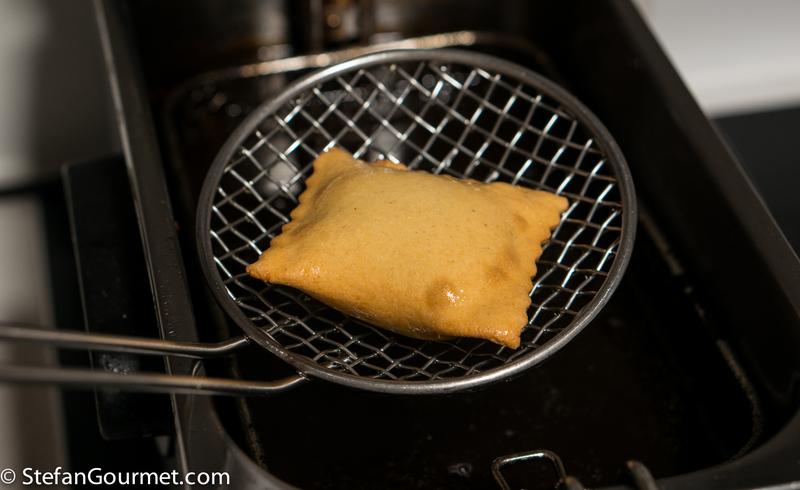 It is more difficult than with normal pasta dough to close the ravioli without breaking the dough. 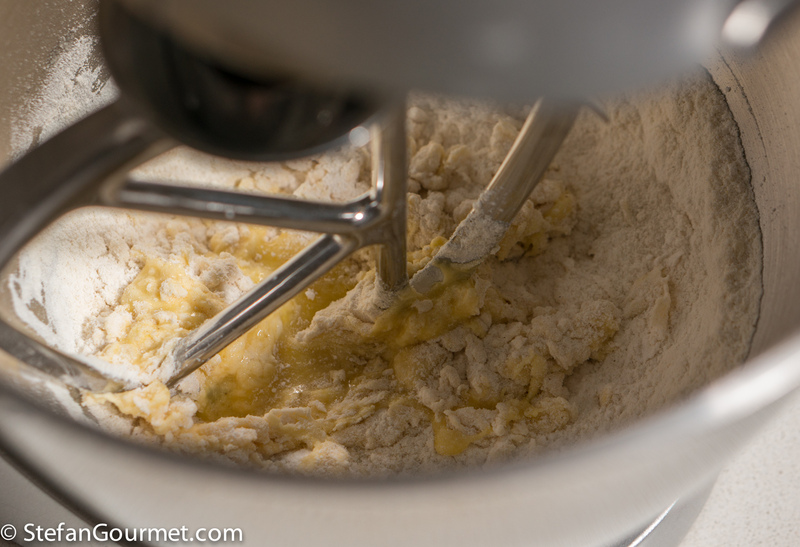 Gluten are a pasta maker’s friend, and because this dough is made with two thirds masa there is less of them. …until they are golden. 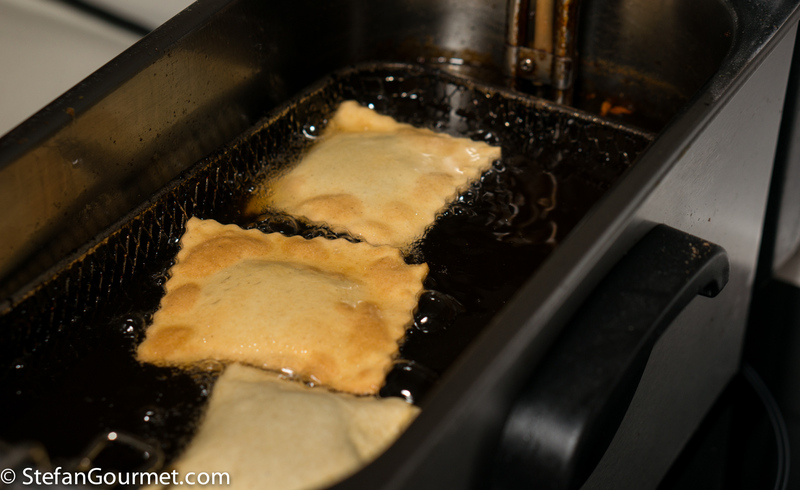 Do not fry too many at the same time, or the temperature of the fat will drop by too much. 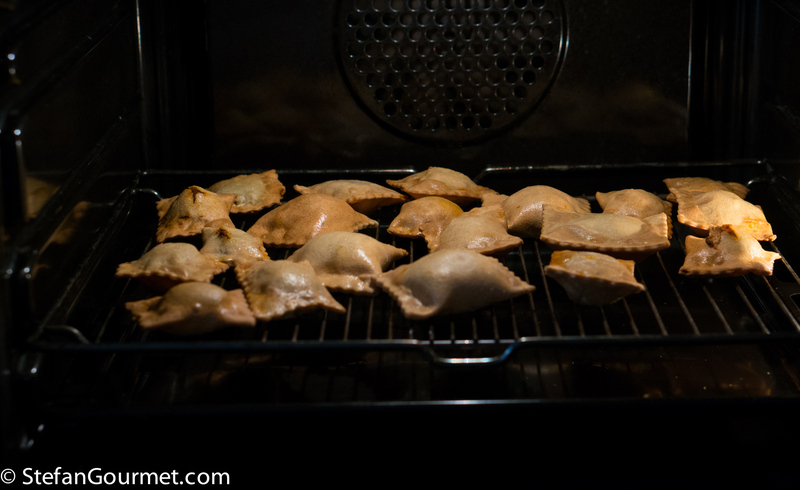 …and keep them warm on a rack in the oven at about 150C/300F. 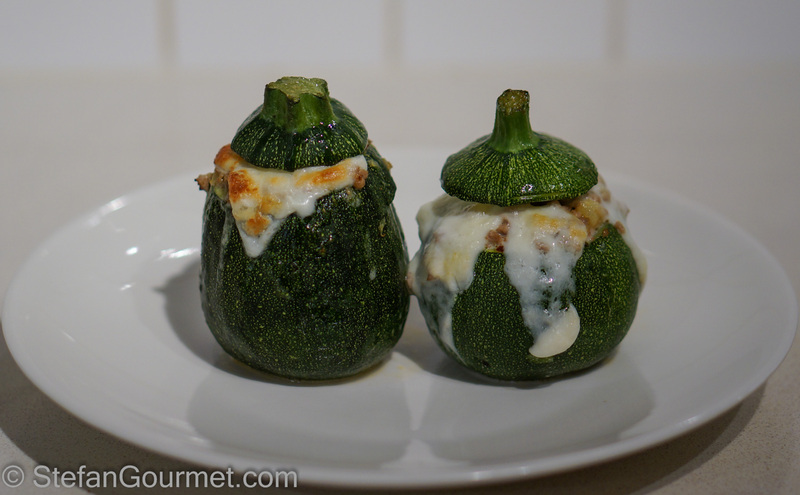 An appropriate flashback for today is these round zucchini stuffed with pork and chipotles. Grazia Paola. Il tuo commento era stato marcato come spam da Askimet 😦 Fortunatamente l’ho salvato. Reminds me of times past, when we run out of quick solutions to finding Hors d’Oeuvres on the fly and fried up ravioli to serve as hot Hors d’Oeuvres. Wow wow wow!!! I love everything about these! 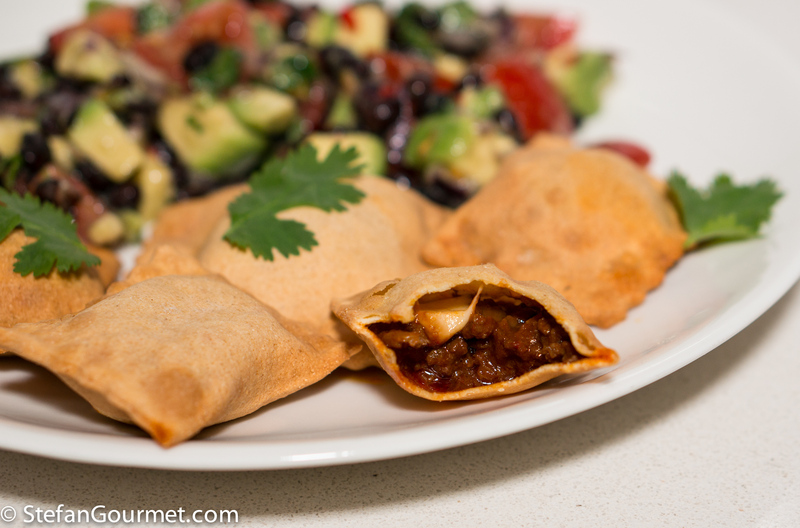 The chili with the corn in it, the smoked mozzarella, and of course the ravioli and salsa! 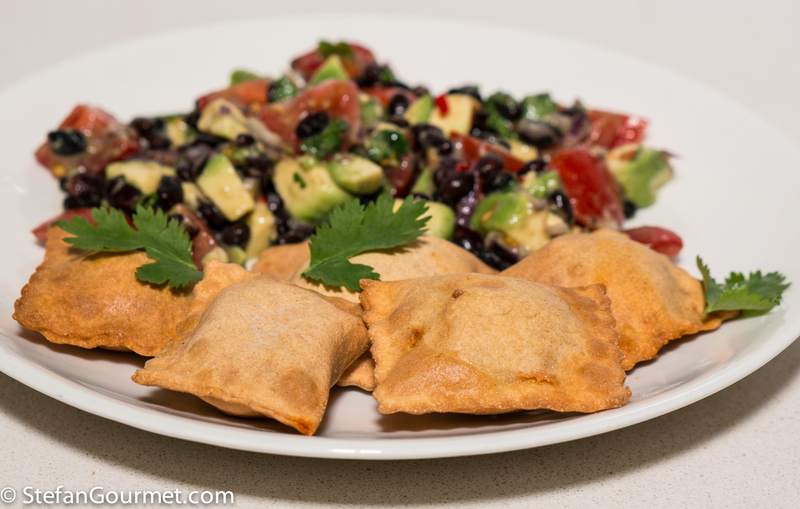 These would be incredible appetizers! Richard would be really proud. Oh my gosh, what an insanely delicious idea!! I have never had (nor seen) smoked mozzarella, but I bet it was great with this. 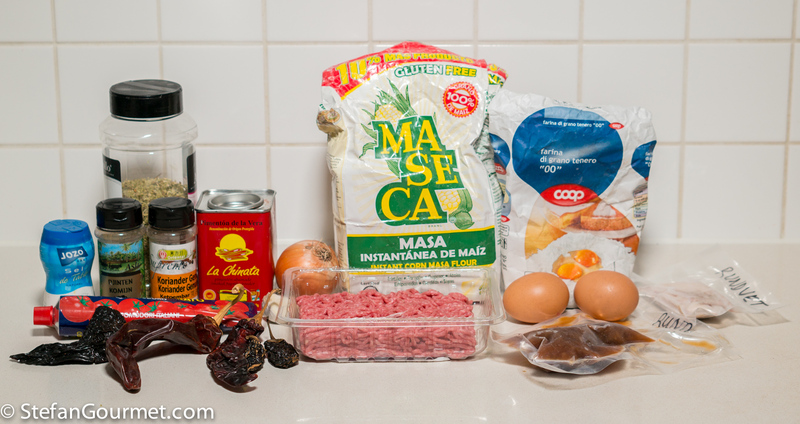 Monterrey Jack is usually my good melting cheese of choice for a Mexican-style dish. Give yourself a pat on the back for this one!! Amazing! Wow! What can I say? You have outdone yourself.